You can also Support my ministry by using 1and1.com to host your Website(s). Just sign up using one of the links below. Make Getting There Part of the Fun! For as long as I can remember, I've been a big fan of games, especially number and word games. Sometime after launching "Aaron & Hur" ministry, it seemed like God began to encourage me to take that passion and create something for Him. And "Bible Travel Games" was born. Bible Travel Games is a 30-page booklet of Bible related word games designed to "scratch your game itch" and point you to the Scriptures at the same time. I hope you enjoy playing them half as much as I enjoyed creating them! For your free copy of Bible Travel Games, just click on the link below. This will open a PDF file which you can print from your computer. If you are able and so led, please consider making a small contribution to my ministry via the PayPal button below. If you're not able or so led, that's completely fine. Enjoy "Bible Travel Games" with my compliments. 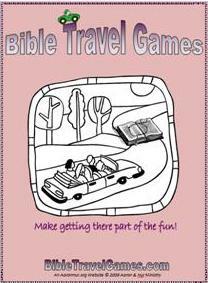 You'll find Bible Travel Games is geared more for older kids or adults. Version 2 for younger kids is in the works.